Server Time Protocol (STP) is a server-wide facility that is implemented in the Licensed Internal Code (LIC) of the IBM® zEnterprise EC12 (zEC12), IBM zEnterprise 196 (z196), IBM zEnterprise 114 (z114), IBM System z10™ Enterprise Class (z10 EC), System z10 Business Class (z10 BC), IBM System z9® Enterprise Class (z9 EC), and System z9 Business Class (z9 BC). It provides improved time synchronization in a sysplex or non-sysplex configuration. Readers are expected to be familiar with IBM System z® technology and terminology. 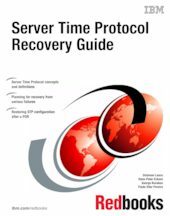 For planning information, refer to our companion book, Server Time Protocol Planning Guide, SG24-7280, and for implementation details refer to Server Time Protocol Implementation Guide, SG24-7281..